It was our first family trip with our two preschoolers and we came back with bulkier arms and thigh muscles. And also a much higher tolerance towards the many challenges thrown at us. This was our first family trip to Hong Kong, including Disneyland Hong Kong, Ocean Park and some shopping around Hong Kong. Unfortunately, this trip has also stretched the father’s limit and he is rather persistent that we will not have any more overseas travels until the girls hit Primary school and learn to be more independent. 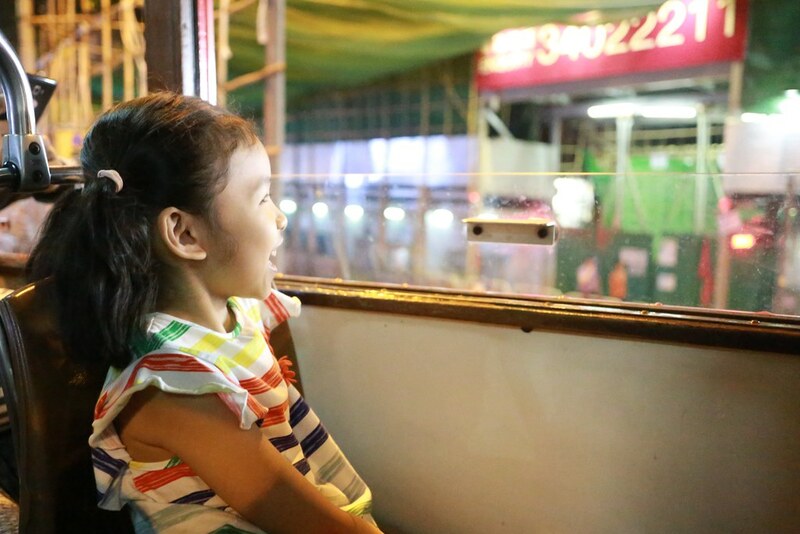 If you are planning a trip to Hong Kong with your children, especially those age below 6, here is a quick “survival guide” from our personal experiences. What works for us may not be what you agree or want to do, but I hope some of the tips will be useful for you! Tips include must download apps, how to save time with Changi Recommends and ways to occupy your preschoolers. 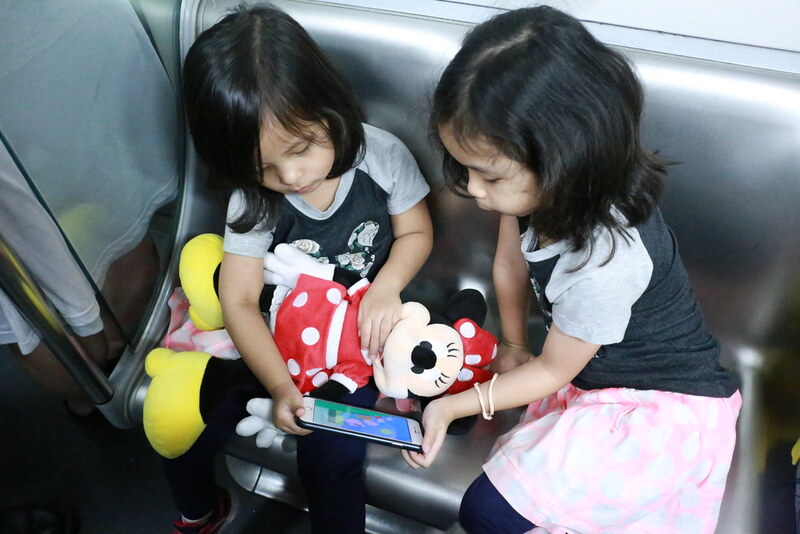 Hong Kong is well connected via MTR and most travellers usually opt for that, but with our two girls, they were happier and with less whining when we take the buses and trams. Probably because they get to see what’s going around instead of the dark tunnel throughout their journey in the trains. Well, except for the train to Disneyland which they would gladly ride a few times I’m sure. Download the MTR and Hong Kong Tram mobile apps, they were very handy during our trip. Including features like trip planner, ride timing, route and costs. We knew Hong Kong will be a trip with LOTS of walking, and it includes LOTS and LOTS of stairs! We wouldn’t be able to carry our two girls plus the stroller when we climb the many stairs. So we chose to leave our stroller at home and we rented strollers at the two parks we visited. Its HK$100 per stroller per day but it’s so totally necessary! Unless you have got super strong arms and legs. If you have a compact and lightweight stroller that you can simply sling on your shoulder and still able to carry the kids with both hands, then do BRING IT! We were there mid-November and assumed that the weather would be cool enough to just keep walking. But we were sooooo wrong! The sun was blazing like hell and we always ended up sweaty after a day out. The next best option was for my hub and I is to take turns to rest and shop. While he goes shop for his stuff, I’ll chill at a cafe nearby with the girls. They can nap on my lap or be kept entertained with the TV in the cafe or their favorite videos on YouTube Kids. Another indoor option is to check out cat cafes. Our girls love it! *Bring linen roller! While he goes shop for his stuff, I’ll chill at a cafe nearby with the girls. They can nap on my lap or be kept entertained with the TV in the cafe or their favorite videos on YouTube Kids. Then we will head back to the hotel where he will look after the girls while I shop till I drop! Ha! Recommend to stay near malls and places you want to shop so you don’t have to travel too far. We stayed at Holiday Inn Golden Mile which is very accessible via train and lots of shopping around. On this trip, we had with us 2 iPhones and 2 iPads, with lots of video watching, photos and videos upload for backups and the many apps and maps we used to find out ways around. I think it would have burnt our mobile bill if we opted for data roaming loh! I got us a ChangiWifi at $5/day for use in Hong Kong, allows you to connect up to 6 devices at any one time and offers very good connectivity throughout our travel around Hong Kong, even when underground! Yes, we are overseas and should spend more time doing things that we don’t get to experience in Singapore, but when there is a playground nearby just go! 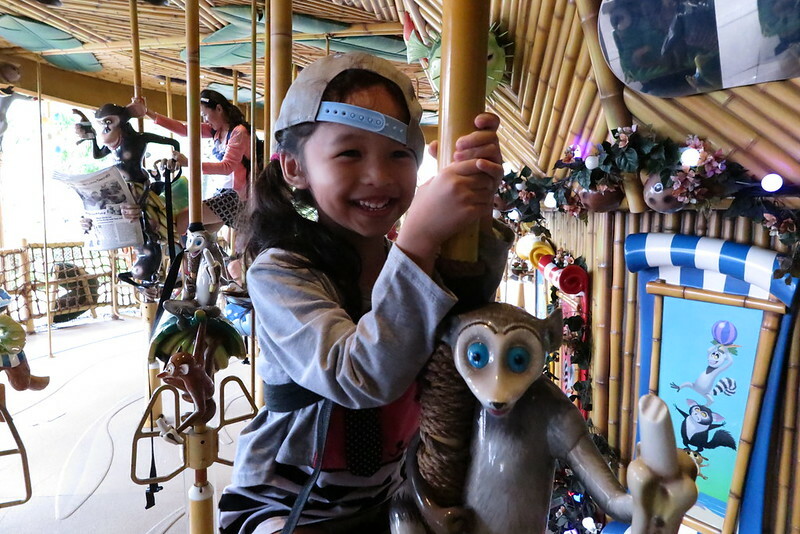 Our girls spent the most time while we were at Ocean Park at their children’s playground. And this was also the time where we parents get to take a break, sit and cool off. They loved the playground so much they didn’t want to leave! Playground, bouncy castle, jumping up and down trying to reach for snacks, and any activity that can let them focus their energy even for that 5 minutes is worth doing. Especially when you are ready to head back to the hotel and call it a day with the kids. 90% of the time they would have KO when they are back at the comfy hotel. Our girls HATE to queue. 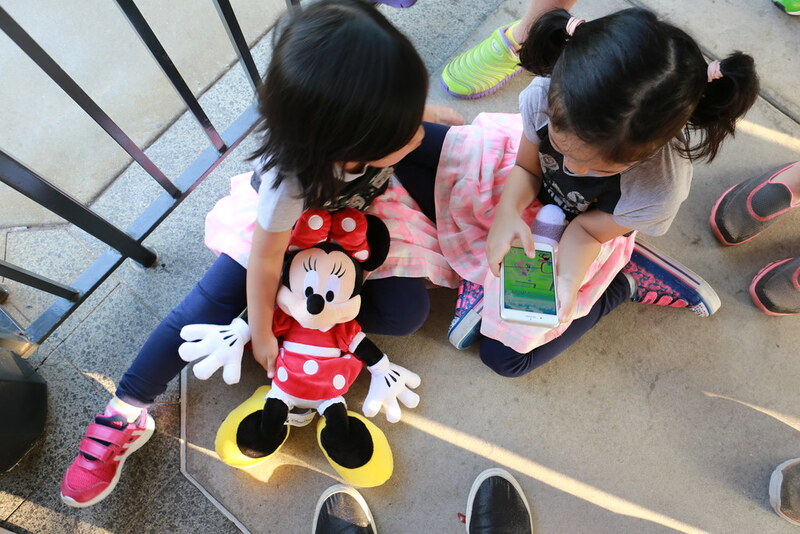 We were waiting in line for photo taking session with Mickey and Minnie which they had wanted to do when we showed them videos before the trip. When I saw the queue it looked like a 10 to 15 mintues max. 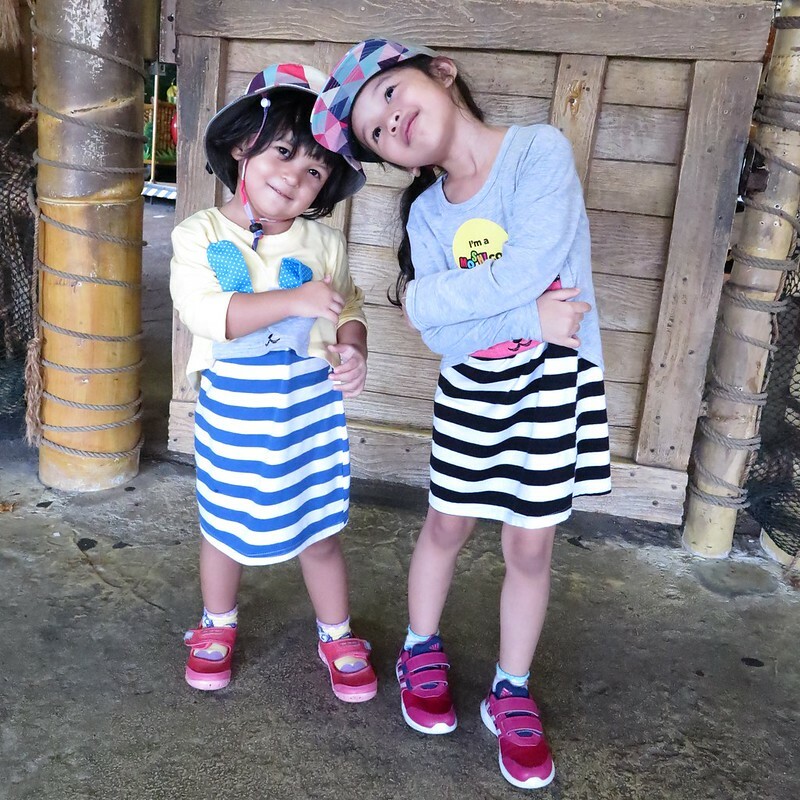 wait according to our experience at Universal Studios Singapore where one family gets some quick shots and leave. I was WRONG! The queue only moved a little after 15 minutes and then suddenly the mice disappeared! With a 2-hour meet-and-greet session, of cos I should have guessed the characters will have to take short breaks in-between or head somewhere to swap the people inside the mascots. But what I didn’t expect was the amount of time they allow each family to spend with the characters! Before you take your nice photos, the character will interact and play with the guests, then they will do 1001 different poses and then more interaction time! This is awesome for paying customers as we get to maximise our money spent on the tickets lah, but seriously?? 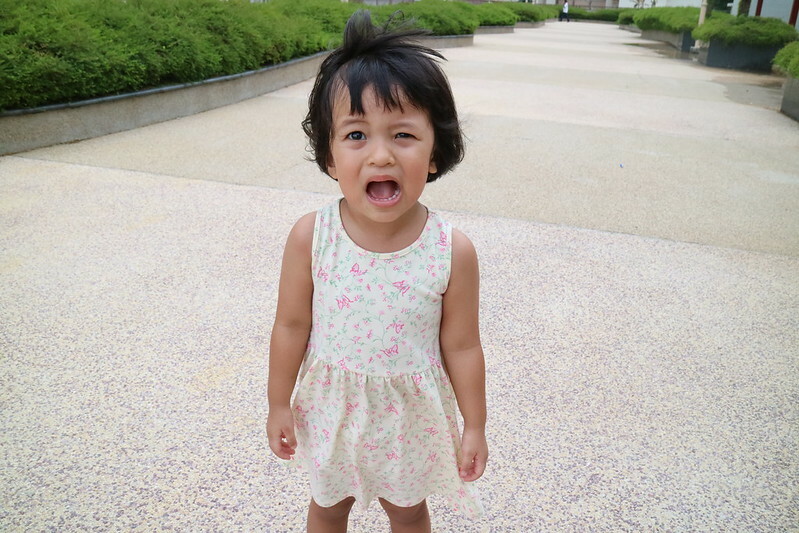 It is a little too long leh. So we ended up leaving the queue after 20 mins in it. Sigh…. This tip is not to ask you to buy any express or fast passes lah, but its one way to cut down one of the many queues you will be joining at these attractions. Skip the ticketing queue and enter straight into the parks when you purchase your tickets online. We got our attraction passes from Changi Recommends website which is cheaper than you buy at the door. Though travelling via the train from Hong Kong airport to our hotel is convenient and cheaper, we opted for a private driver to pick us up instead. With kids, bulky luggages and tired parents (after three over hours of pacifying the little ones in the plane), airport transfer is highly recommended. We booked our overseas airport transfers through Changi Recommends, together with a few other services they provide. 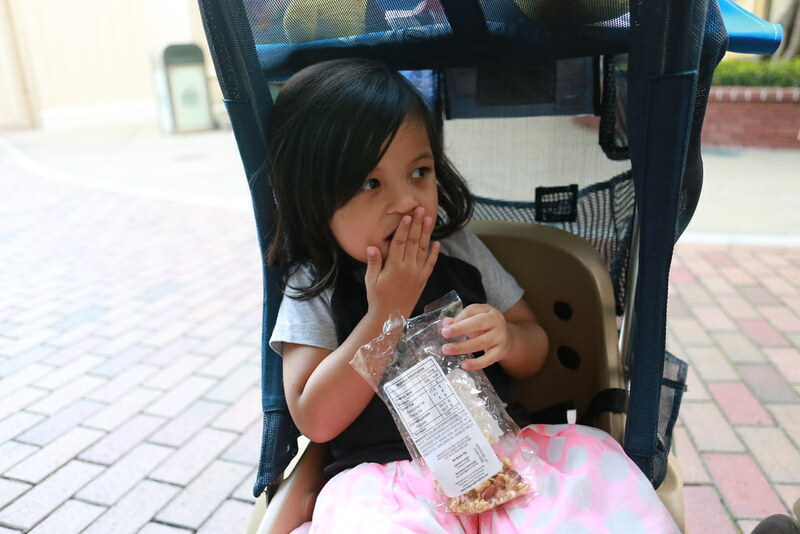 And I’m so glad I made this choice because when we landed in Hong Kong, my girls were rather grouchy when we boarded the vehicle. The personal pick-up, with a chauffeur to send us right to the doorsteps of our hotel, sure saved us lots of stress and energy. For families travelling in Hong Kong, when travelling around, it could be more economical and sensible to ride with Uber. After our not-so-happening-and-damn-tiring first night, we opted for Uber rides for the rest of our trips whenever we have to travel long distance – like from the hotel to Ocean Park. Hope the above tips are useful! If you are heading to Hong Kong soon, here’s a giveaway for you! Share this family travel guide to Hong Kong on Facebook, and ensure it is set to public so we can see. Tag 2 friends to share this guide with and hashtag #thelovingmum in your post. Comment on this Facebook post so I know you’ve completed the above. Winner will win 4 tickets to The Peak Tram (2 adults + 2 children, tickets expire 30 March 2017), and this giveaway will end on 2 December 2016 at 11.59pm.